Akko: No Frills, Fantastic Fish in Israel Eric Westervelt would risk rocket-fire for the food at Uri Buri, a restaurant in Akko, Israel. The Middle East correspondent says don't come for the minimalist decor, but for the fresh and inventive seafood dishes of chef/owner Uri Jeremias. NPR staff share their favorite places to eat, drink, stay and visit in the cities they cover. Owner/chef Uri Jeremias emphasizes fresh, innovative fish dishes at Uri Buri, a restaurant in Akko, Israel. The restaurant is housed in a 400-year-old Ottoman-era stone building. 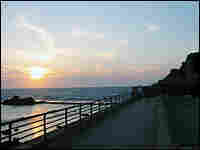 Catch a view of the sunset from Uri Buri. Israel's sleepy, Crusader port city of Akko — also known as Acre — lies just 12 miles from the Lebanese border, well within range of Hezbollah rockets. 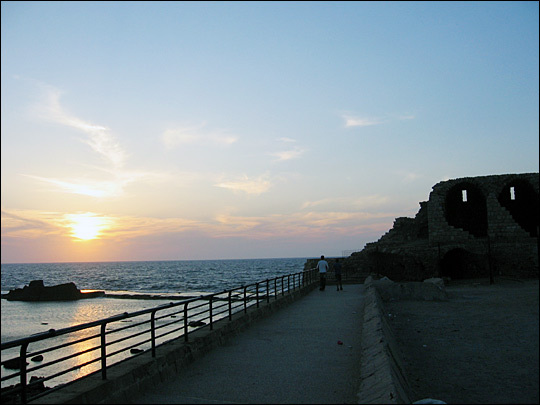 In 2006, during the last war between Israel and the militant group, Hezbollah's steady rain of Katyusha rockets turned Akko into a near ghost town. But one of the few places to stay open was Uri Buri Fish Restaurant, in a 400-year-old Ottoman-era stone building tucked in among the city's ramshackle old fortresses. 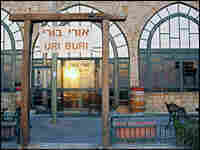 And I'm happy to report Uri Buri is still open and thriving, despite a big post-war drop in tourists venturing to Akko. At Uri Buri, the focus is fish and flavor, not ambiance. There are no pictures on the walls, no musical distractions. The paint and plaster are peeling in spots. One might charitably call the decor "minimalist." Many of the dishes arrive in the pans or skillets in which they were cooked. But the charm is in owner and chef Uri Jeremias, who is likely to serve the meals himself and personally check to make sure you like your meal. With his thick, long, elfish beard, ample paunch and mischievous smile, Jeremias looks like he just stepped out of a Tolkien novel: Think Santa Claus by the sea. Most every night, Jeremias offers his "taste of the chef's table" menu — a delicious culinary trip through Jeremias' choices of some of the most creative fresh fish dishes in the eastern Mediterranean. Most meals are served family-style, and you can sample full or half portions of any combination from the menu. For an appetizer, try fresh jackfish smothered in lemon, capers and onions, or the baby Saint Peter's fish (tilapia) grilled and served with caramelized beets. I recommend the sashimi salmon in soy sauce with wasabi sorbet. (It's just one of many creative sorbets Jeremias is likely to offer — try the arak/anise or grapefruit sorbet as a between-course break or his fantastic beet-horseradish sorbet with a meal.) His Thai-esque seafood soup — shrimp, calamari and mussels cooked in a coriander, basil, ginger and coconut milk base — is also a good choice. For a main course, sample the barramundi fish with creamed spinach and pecorino cheese or the crab cooked in a cream-and-seaweed sauce. Also very good are spicy calamari and shrimp with carrots served over a bed of Israeli rice, small cous cous-like pasta balls. Jeremias also offers several strikingly tasty "in cauldron" main dishes. Personally, I'd risk mortar-fire for his sea bass baked in cauldron with chili peppers, coconut milk and apples. The cauldron trout with green onions, spices and a cream sauce is also delicious. The pan-seared scallops in cream sauce — his version of coquille St. Jacques — are delectable. Jeremias also offers several very good offerings centered on seasonal fruit, including a fiery, five-spice Creole shrimp with fresh mango. End the meal with wonderful homemade ice cream — mint or rose water, perhaps — or taste his unique kiwi "soup" or one of the more traditional desserts. 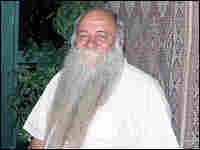 "I want people who really enjoy food, who aren't snobs," the gnomish Jeremias declares. "If you can't enjoy fish without fancy plates, this place is not for you." Jeremias is self-taught in the kitchen: He never formally studied cooking and never trained with any chefs. In fact, he only started writing recipes down a few years ago, when someone asked him to do a cookbook. "I just cook what I like. All these are games I'm playing with food," Jeremias says. "Some people are suspicious of small dishes and variety," he adds, "but I see this as an evening of entertainment with food." 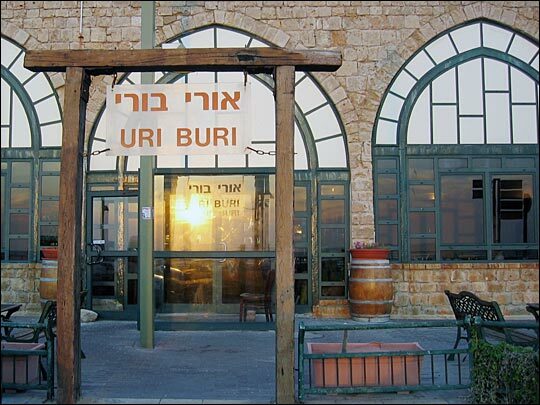 Uri Buri Fish Restaurant — Akko Lighthouse Place, Akko (Acre) Israel. Telephone: 972-4-955-2212. Open daily for lunch and dinner from noon until midnight. Cash and credit cards accepted.